We know good customer relationships are vital to your business. When your customers need assistance they should receive friendly, personal service. It's important to provide this service even when you are not available. With telephone answering and support solutions provided by our NOC (Network Operations Center) you can be assured all your calls will be handled in a professional manner. We're staffed 24 hours a day, 7 days a week, 365 days a year. Baca Valley’s NOC provides a very cost effective way to make sure you are "always there" for your customers. We offer you the flexibility of choosing your level of support… 24-hour, on demand, or after hours. Your calls will be answered with your company name and your personalized greeting. We make sure your customer service procedures are followed to your exact specifications. It's our responsibility to deliver your telephone messages in the manner that is most convenient for you. You have the option of choosing message delivery by phone, by fax, or by electronic mail. We will help you determine what method of delivery works best for you. Your report logs will be customized to provide the data that is important to you. You will receive the information in a format that is easy to read and understand. Internet problems don't happen just between 8:00 and 5:00! Our Network Operations Center provides around the clock technical support for our Internet services as well as for other ISPs. 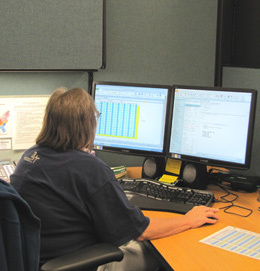 The Network Operations Center is staffed 24 hours a day, 7 days a week, 365 days a year.